Combustion processes and occurring inert forces result in mechanical vibration of the engine block in its suspension. 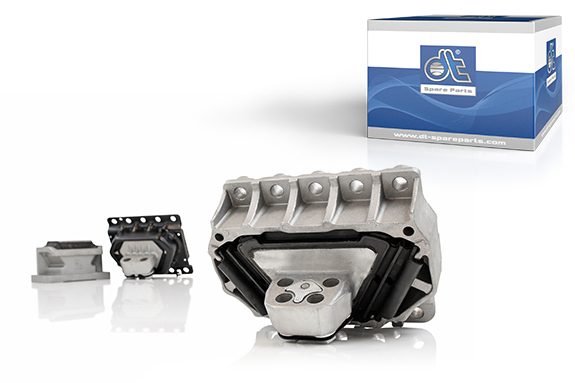 In addition to securing the engine and absorbing the static loads, engine mountings of the brand DT® Spare Parts ensure reliable damping and vibration-isolated engine suspension. In the case of the rubber-metal composite used for engine mountings, a special adhesive ensures optimum vulcanization. The incorporated rubber and the high-strength aluminum are previously screened using a tomograph, thereby guaranteeing a void-free material. Using pressing-bending equipment, the rubber core, which is reinforced by additional steel plates, is pressed into the aluminium body. The processed steel plates provide additional strength. Due to the angled mountings, a uniform distribution of force is ensured. Precise workmanship and optimum coordination of the individual components ensure the value of adjacent parts is maintained, as well as enabling simple and speedy assembly. The engine must be placed slowly and evenly on the respective engine mounting. The cross-tightening of the screws to the specified torque and a built-in detent plate ensure that the engine is held securely. Through the use of different coloured markings, the varying vibration damping properties of engine mountings are identified. Further markings, such as a batch number, guarantee traceability. In addition to engine mountings, DT® Spare Parts also offers all standard gearbox mountings.